Give yourself an unforgettable and nourishing holiday in a quiet and comfortable atmosphere. 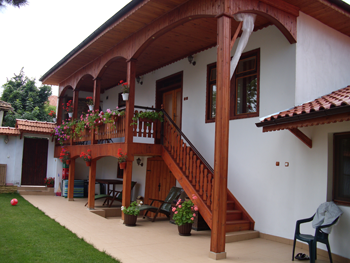 You’ll find the house situated in the small town of Veliki Preslav, at the foot of eastern Stara Planina and the Preslavian Mountain. The country is rich in unique surroundings and fresh air. The house is totally at your disposal with its four double rooms, fully equipped with everything you might need for the convenience of your stay. Additional accommodation is also available. The house has its own tavern with capacity of 20 persons. There’s a barbeque and a furnace for the summer season. The house has a large fully equipped kitchen available for the guests. You can use the kitchen to prepare your own food or try the tasty dishes prepared by the hosts. Make your family a lovely surprise for their special celebrations and anniversaries by keeping the whole house for the weekend or for an evening! The vast yard is made into a wide evergreen lawn. The imposing walnut trees make the hot summer days cool and refreshing. One can sunbathe by the compact pool and enjoy the typical Bulgarian archaic boyar atmosphere – all modern conveniences perfectly complement the old fashion architecture! The hosts also offer different routes to nearby historical places of interest like the ruins of the old town of Veliki Preslav, Pliska, Madara, the Shoumen plateau, as well as many others. We have an individual solution for each and every single whim of yours!Please inform us in advance if you wish to bring your pets with you. If you send a reservation inquiry online in the Reservation section, please be sure to provide your telephone number. We shall call you back to arrange your perfect stay! For the Easter Holidays and St. Georges day we offer the preparation of roasted lamb in our specially designed furnace! The price varies in accordance with the weight of the animal. There’s a possibility for playing a game of tennis (on a nearby tennis court).